*NOTE 1: To roast the garlic, place 20 unpeeled garlic cloves in a small casserole dish, drizzle with Coratina EVOO, cover, and roast for 20 minutes at 375 degrees. *NOTE 2: Look for the annatto paste in a Mexican market. The El Yucateco brand is preferred. It's also available at amazon.com. In a very large bowl, stir the water, apple cider, kosher salt and sugar until the salt and sugar are dissolved. Line a stock pot with a large, sturdy doubled plastic bag. Put the turkey in the bag, neck first. Pour in the brine and seal the bag, pressing out as much air as possible. Brine the turkey in the refrigerator for 24 hours, turning the turkey every now and then. Remove the turkey from the brine and discard the brine. Pat the turkey dry and transfer to a large rimmed baking sheet. In a blender, combine the roasted garlic with the 10 raw garlic cloves, the Olive Wood Smoked Olive Oil, orange juice, cider vinegar, kosher salt, lime juice, oregano, chipotles, annatto paste*, cumin and allspice. Puree until smooth. 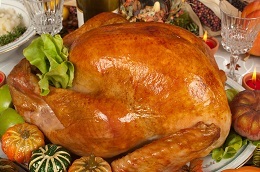 Slather the turkey inside and out with the marinade, cover and refrigerate for 24 hours. Preheat the oven to 325°. Lift the turkey out of the marinade and set on a rack in a roasting pan. Brush the breast with some of the marinade. Pour 1 1/2 cups of the stock into the bottom of the pan and cover the turkey very loosely with foil. Roast the turkey for 2 hours. Remove the foil and add another 1 1/2 cups of the stock to the pan. Continue roasting for about 2 1/2 hours longer, until an instant-read thermometer inserted in the thickest part of the thigh registers 175°. In a large saucepan, heat the Olive Wood Smoked Olive Oil. Add the giblets and neck and cook over moderate heat until browned. Transfer to a plate. Add the shallots, carrots, celery and onion to the pan and cook, stirring occasionally, until softened, about 5 minutes. Return the turkey parts to the saucepan. Stir in the roasted garlic and peppercorns, add the remaining 6 cups of stock and bring to a boil. Simmer over low heat until the stock is reduced to 4 cups, about 1 1/2 hours. Strain the enriched stock into a heatproof bowl and discard the solids. Transfer the turkey to a cutting board and remove the rack from the pan. Pour the pan juices into a bowl and skim off the fat, reserving 2 tablespoons. Transfer the reserved fat to a saucepan. Add the butter and flour and cook over high heat, whisking constantly, until golden brown, 2 minutes. Add the enriched stock and bring to a boil. Simmer over moderate heat until the gravy is reduced to 3 cups, about 10 minutes. Place the roasting pan over one burner on high heat. Add the strained, defatted pan drippings (there should be 1 cup) and scrape up any bits stuck to the bottom of the pan. Strain the pan drippings into the gravy and season with salt and pepper; keep warm. Carve the turkey and transfer the slices to a platter. Serve with the gravy. NOTE: This is an adaptation of a Chef Jose Garces recipe that follows the traditional preparation of a Yucatan dish called cochinita pibil, a slow-roasted pork marinated in citrus and annatto paste.